Hi everyone! I’m so excited to be part of Tie Dye Diva’s Mermaid Maxi Skirt Blog tour because I can finally share my lovely skirts with you! If you’ve been following along with the other tour bloggers then you’ve already seen some pretty gorgeous skirts. 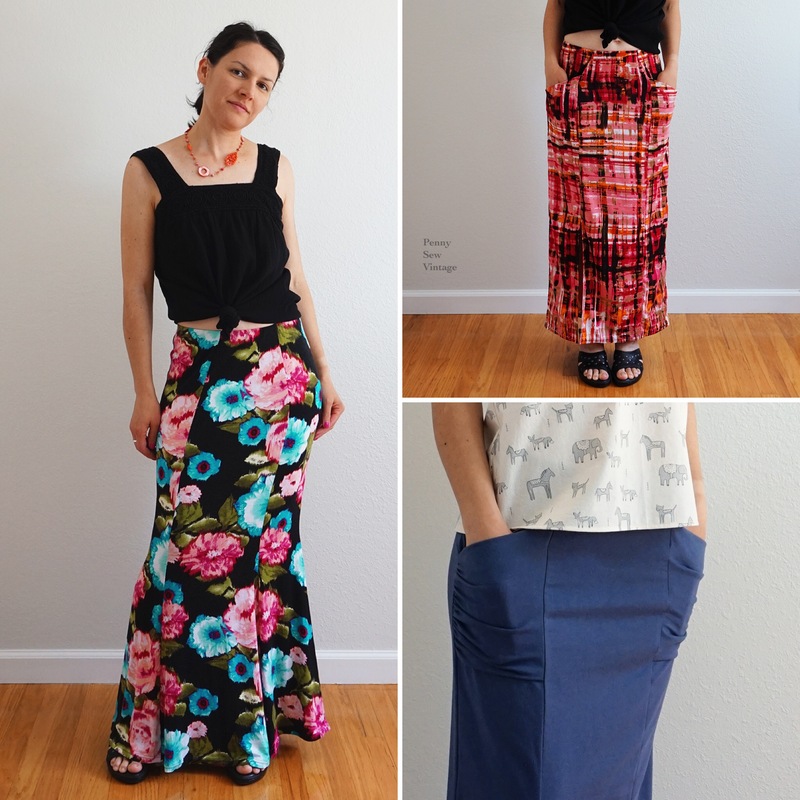 To think, before this pattern I would never have thought of myself as a maxi skirt kinda gal, but that has totally changed! Being on the shorter side, I always thought maxis just looked better on taller ladies. I would try them on at the store and be very disappointed as they were not flattering at all. 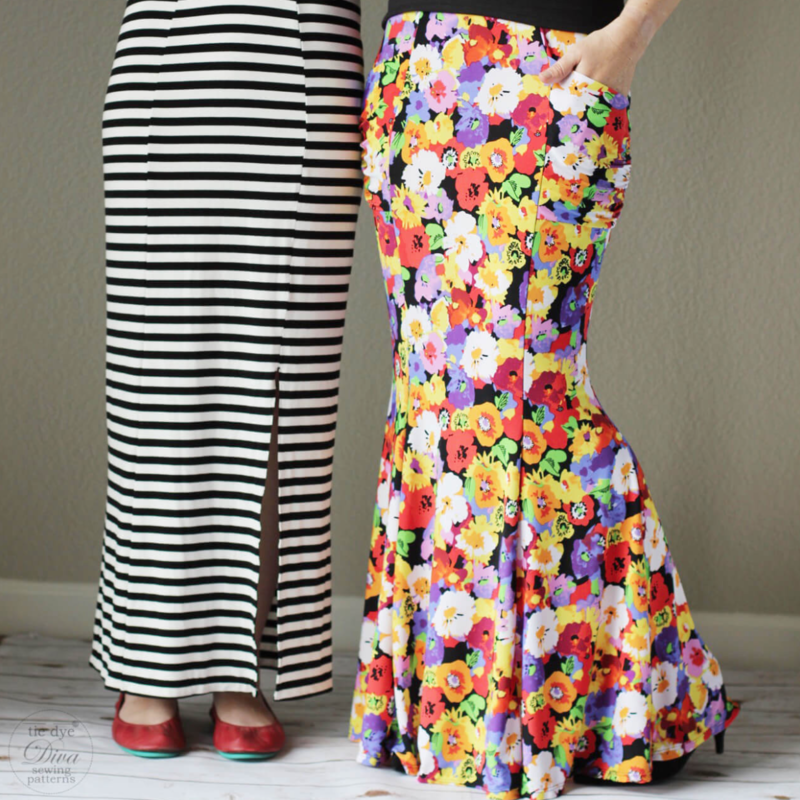 I figured I just couldn’t pull them off, but then I saw a little sneak video of Jen, the brilliant lady behind Tie Dye Diva Patterns swishing in her mermaid maxi and thought, she’s only an inch taller than I am…I’m totally going to make one if I can look like that! 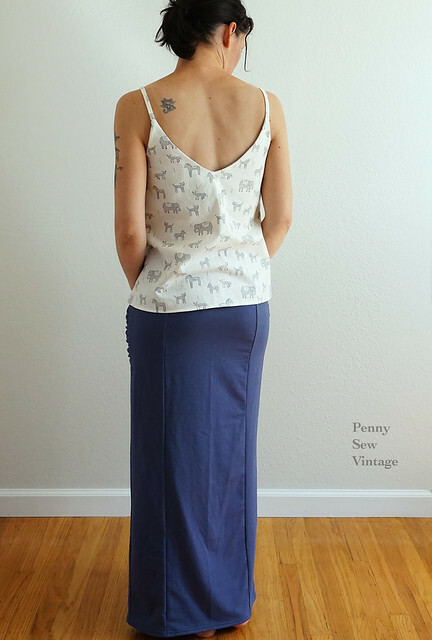 So here are the pattern’s details (besides the fact it’s 20% off this week): The Mermaid Maxi Skirt*(afflink) is available in a wide range of sizes, from size 0 to 26, includes a straight maxi with a slit or a fitted maxi with a swooshy flared hem (which I might add makes everyones’ backside look uh-mazing! ), and either gathered or flat pockets. 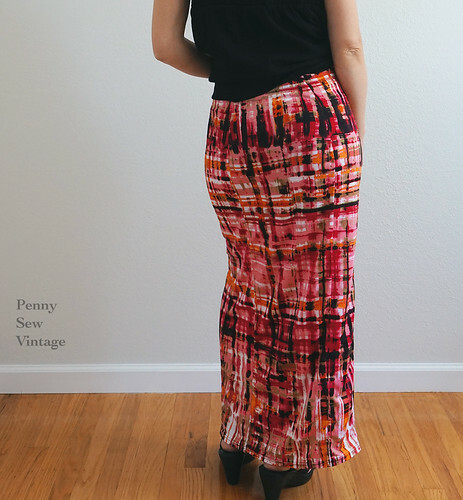 It also provides layers for easy printing, clear, detailed instructions on customizing fit, and impeccably illustrated step-by-step instructions that made sewing these skirts a breeze. 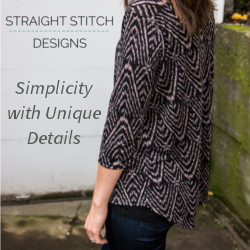 My absolute favorite thing about this pattern is its simplicity, and the pocket construction is genius! There are no tricky steps to achieving this seemingly invisible pocket either. In fact there are no tricky steps in this pattern at all which I think is a testament to how well it’s put together. Did you notice there’s no visible topstitching on the waistband? These skirts came together so quickly, which is probably why I made three right off the bat. I just had to make all of the versions! My first maxi is a straight version with flat pockets in a poly spandex knit fabric from Girl Charlee (been in my stash for a couple of years). It’s actually my muslin which is why I began with the straight version (less fabric required) in a size 2 which is my hip size, and I shortened the length by 4″ (eta: I’m 5’3″). This style has several panels which make custom fitting very easy, but in the end I didn’t need to do that because it fit so well already. Even the straight version hugs your hips nicely! Of course I had to make the flared, or mermaid version next because that’s what I really came here for after all, right?! 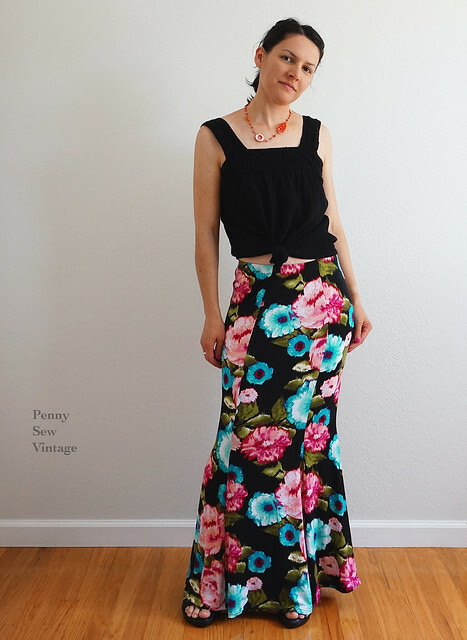 The fabric for this lovely version was graciously provided by Simply By Ti, and I just fell in love with this fun and lively large floral print rayon spandex. The colors are gorgeous and the drape is relaxed and flowy, giving this skirt the fluid motion I envisioned. I just love the way it hugs the hips and thighs and flares out at the knees. It’s incredibly flattering and so versatile. I omitted the pockets for this version because I really wanted the focus to be on the silhouette. Also if you haven’t already, check out some of the great knit fabric available at Simply By Ti, and grab 20% off at checkout using the code MERMAIDTOUR through May 28th. My final version is another straight maxi with the gathered pockets this time. This one is made in a luxurious slate blue organic cotton/bamboo stretch jersey knit from Cali Fabrics, and it has plenty of stretch and excellent recovery. I think this fabric would also make a lovely flared version as well. This is the perfect basic skirt that can be worn any day of the week, but it boasts a little fun with those pockets right?! It’s those little touches that really take a handmade garment up a notch, and with these pockets it’s so easy to do that too. Can you believe I considered skipping the gathered pockets? Yeah, I question my sanity sometimes too. Last but not least there are lots of goodies and prizes to celebrate the release of the Mermaid Maxi Skirt, so don’t forget to enter to win some stuff for yourself! 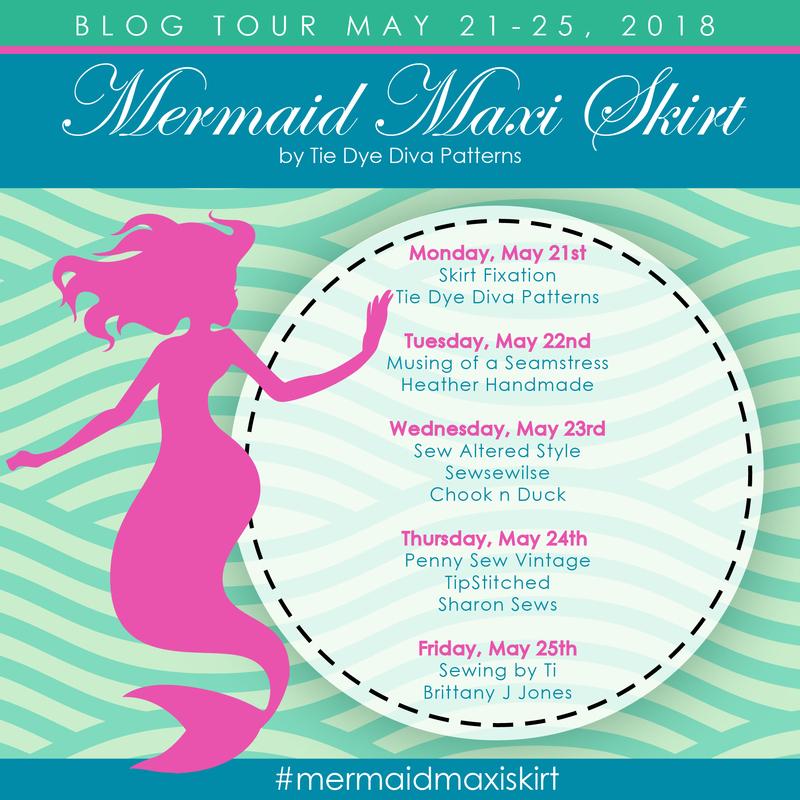 Stop by Tie Dye Diva’s Blog Tour and Giveaway post to enter, and don’t forget to take a look at all of the other fabulous Mermaid Maxis made by the other tour bloggers (links below)! What a trio of fabulous skirts! !